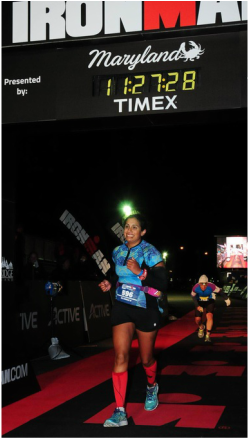 First time Ironman triathlete Nat H.
crosses the finish line at Ironman Maryland! My first Ironman was Maryland (IMMD) 2014, it’s first year. I really enjoyed working with Alan, and despite living in cities separated by a 4-hour train ride, everything worked great. Alan’s plan for me had me working out 10-11 times a week and actually putting nutrition practice into the regimen (nutrition IS the fourth disciple of triathlon). I can’t list on one page all the blind spots I had (even after having two well-known books on Ironman prep) before hiring him. I’m so glad I did! Books are great but I got way more from Alan than anything I ever read. Going into IMMD, my goal was to finish and my dream was to do it in less than 12 hours. Before the sun set on race day, I came in at 11:54:47! ​a Tough Mudder obstacle course race! Alan was my trainer for 1.5 years and in that time I lost 100 pounds and became a better version of myself inside and out. Initially, my biggest fear was failing. Yet Alan was so quick on his feet. When he would see me struggling to complete an exercise, he could modify it instantly so I would be successful. He created a weekly workout schedule for me and I followed it and he could tell. He could tell because I was having results. I wasn’t just losing weight, but I was gaining confidence, endurance and strength. Alan helped me save my life. When I met him I was 34 years old and 274 pounds. I was on the fast track to a heart attack by age 40 if something didn’t change. Since I met Alan, my life has changed. 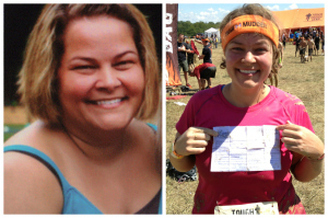 I lost the weight, I completed a Tough Mudder, I fell in love and got married, and I am healthy. I eat well (most of the time) and exercise on a regular basis and that is my natural lifestyle now and I love it. And it’s because of Alan. the Richmond Half in 1:43! Alan helped me prepare for the Hood to Coast relay race in August where I completed a total of 18 miles in three segments, and then my first half marathon in November. I diligently followed all of Alan's training, and the results were GREAT! I went from running a 9:30 minute/mile pace when I started working with him in May to averaging 8:20s at the August relay and sub 8 minute /mile splits for the Richmond Half Marathon. And I never got injured! These events were challenging but I was able to enjoy them because Alan had prepared me so well, and I felt very proud of what I was able to accomplish with his help. He provided a preliminary consultation with video-enabled running gait analysis, daily workout assignments via the Training Peaks app every week and we met 1x/month in person to talk about things like nutrition, equipment, sore knees, etc., and race planning. ​He is an accessible, enthusiastic, knowledgeable, and caring coach who wants you to achieve your best and meet your goals, and he does everything he can to help you make that happen. Training with him is a very worthwhile investment! ​and is stronger than ever. I began working with Alan in the fall of 2012, just after completing the physical therapy sessions that followed my second back surgery. I had always exercised, but I knew I needed more. My hope was that Alan could help me get strong enough to minimize my pain and prevent further surgery. Alan patiently stepped me through those early days when I could barely stand. His understanding of anatomy and strict attention to form made me immediately comfortable that I had made the right choice of trainer. One year later, I was having regular pain-free days for the first time in fourteen years. Two years later, I remain injury free and have begun to compete in sprint triathlons. At 41, I am stronger than I have ever been and Alan has exploded many of the limitations I was placing on myself without even realizing it. He helps me accomplish more than I ever thought I could. I tell anyone who listens – the choice to train with Alan has been one of the best decisions I have ever made. Marnie crossing the line at Ironman Maryland! Alan is truly the BEST trainer/coach out there. He just helped me accomplish my life long dream of becoming an Ironman. I never thought it was possible, but I am now an Ironman! More surprisingly, I finished in 14 hours and I wasn't even sore the next day! That's a true testament to my training and conditioning and that's all because of Alan and his plan. The thing that I like best about Alan is that he tailors your training plan for what works best for you. I don't like drills so he didn't give me any. He makes the goals achievable so you believe you can do it. He really tries to figure out what works best for you and then he comes up with the perfect plan. Beyond the training he is always reading and learning and implementing new things. He really knows his stuff. Plus he is an exceptionally nice man and he really cares. He checks in on you and gives you pep-talks and walks you through the race in advance. He really does everything he can to make sure that you succeed I could not imagine there is a better trainer/coach out there! Thank you Alan for making my dream of becoming an Ironman come true! Carly is dropping both sizes and running times! Work has always been my #1 priority – I never thought much about fitness and blamed it on my busy schedule. I was diagnosed with scoliosis as a teenager and, as a result, suffered from frequent lower back and hip pain. Fed up with struggling with my weight and being in pain at age 24, I began training with Alan and TriFit Evolution. It is one of the best things that has ever happened to me! Since I started a year ago, I’ve dropped 20 lbs. and 3 sizes. In September 2014, I finished the Navy-Air Force Half Marathon in 2:49:05; in September 2015, I finished the same race in 2:14:51, 35 minutes faster than I ran it the year before. Before TFE, exercise was a chore, something I thought I didn’t have time for. Now, I make the time to exercise at least five times a week because I want to. In addition to being a genuine pleasure to work with, Alan has truly inspired me to be my best self through regular exercise and a consistently healthy lifestyle. He knows exactly what I need to do to be successful because he has taken the time to get to know me. I’m stronger now than I’ve ever been, and plan to complete the 2016 Navy-Air Force Half Marathon in less than two hours … perhaps I’ll even consider going for 26.2 in my 26th year! I have been working with Alan for the past three years, having been referred to him by Dr. Kathy at Positively Chiropractic while living in Alexandria, VA. I mentioned wanting some running specific training, as I was tired of sprained ankles and generic running workout plans found on the Internet. I needed someone to hold me accountable, and someone to help me avoid injury by giving me guidance with my form. We met, he asked a lot of questions, and I did my best to answer. I remember I told him my goal was to run a sub 2:00 half marathon. After a winter/spring full of ups and downs, I was seeing results. I had PR’d on a half and a 5k. However, my rowing season was about to begin. (I’ve been a competitive rower for over 20 yrs). Alan worked with me all summer and fall giving me workouts that I could do in addition to rowing. In September, I ran the Navy-Air Force Half. We talked about my plan, and I went out and executed. I didn’t just exceed my expectations, I smashed them. 1:50 on the half marathon. Later in October, I PR’d on a marathon one week after my A rowing race of the fall. I thoroughly enjoy working with him. He’s personable, energetic, encouraging, and honest. Prior to meeting Alan in March of 2012, I was predominantly a marathon runner with the goal of entering the triathlon world. I could not swim more than 12m in the pool or run more than 10 miles without hip pain. Complicating matters is the fact that I am a physician and mother of 2 children with a very demanding schedule. Alan had his work cut out for him but rose to the challenge. Through intensive swim training which involved drills, video analysis (above and below water), interval sets, strength training and tips for open water swimming, I was able to comfortably swim 2000m in 1 year and 4000m in 2 years. In the bike arena, he helped me become comfortable in aero position improved my bike pedaling form, gave me tips on safe riding and helped me increase the duration of my long ride to 115 miles. He helped me become pain-free on all of my runs by improving my running form (again through video analysis) and strength training. Two years after starting to training with Alan, I successfully the finish line of Ironman Maryland! I am grateful to TFE for helping me reach these life-changing accomplishments and would mostly strongly recommend him to anyone. Teresa, on top of the podium! ​Best. Coach. Ever. As a competitive runner and triathlete, I was looking for a coach who could help take my training to the next level. For years I self-coached and my workouts were getting repetitive and my performance was stagnant. Alan's expertise, positivity, and competitive nature combined with specific and personalized workouts was exactly what I needed. He is easily accessible, provides timely feedback, and really takes into account my short and long-term goals as both a runner and triathlete. In short, he's awesome! Vit, during his first Ironman! ​Alan is a amazing triathlon coach. He offers specific, actionable suggestions and is fully invested in helping people achieve their best. His advice was invaluable in preparations for my first Ironman race. For me, he offered significant guidance related to pace, bike cadence, nutrition, hydration, equipment and routine, and it made a difference. He is positive and enthusiastic, and has a wealth of knowledge born of experience as an athlete. Alan is the best trainer I have ever worked with. He targets the right exercises to reach your goals, and will push you as hard as you want but not to excess. I wanted to ski well after years off, and I was able to (in Co) without any soreness afterwards. I'm 60 but felt better than I did 15 years ago! Alan knows exactly what he’s talking about. He explains how each exercise impacts your body and helps you to avoid injury by making sure your form is correct. For example, I avoid lunges bc they hurt my knees. Instead of saying “ok,” and moving on, Alan showed me that I had been doing lunges improperly—even when I thought I was being careful to do lunges properly. Alan is also very knowledgeable about nutrition and helps me create quick simple meals. Alan helps you enjoy training — even when he’s pushing you to give your best effort. We actually have fun!! He's a knowledgeable trainer, a fun trainer- and I'm a very happy client!! After I returned to running, I decided to try competing in a sprint triathlon and was hooked. By the end of my first season, I knew I needed help to improve my skills to become stronger and more competitive. I started training with Alan in January 2013 and in my first season training with him saw improvements in my fitness and times and even made it on the podium for my division. Those improvements continued into the next season as Alan coached me in specifics for my races, both triathlon and long distance running. I reached every race goal set, including taking more than an hour off my course time for an Olympic distance triathlon and 15 minutes off my half marathon personal record. Alan has been a vital partner in my success. He is a trainer, a teacher, and a coach who provides helpful knowledge, the right amount of motivation, and exceptional guidance on how to achieve my goals. As I continue to strive for new endurance fitness goals, I consider Alan an essential component to my success. An 18 year old injury from running track flared up with a vengeance to the point where I could not run, walk, sit, or lay down without pain. I had to stop all of the outdoor activities I loved and sought many professionals for answers. I have worked with a number of personal trainers but it wasn't until I worked with Alan that I saw real results. He thoroughly assessed my current physical state, taking into consideration my old injury and how it affected my body and created a plan that targeted specific muscles groups to strengthen not only my hip but my overall body. His expertise and thorough knowledge base helped me progress to where I have finished my first sprint triathlon and even ran 2 half marathons! I have trained with Alan for the past couple of years and absolutely love working with him! As of late, I am participated in a small personal training group. During these personal training sessions, he takes time to demonstrate exercises and to provide options for modifying exercises to meet the needs of individual group members. He is detailed and focused on insuring the safety and personal growth of each participant - taking time to observe group members in action, but also to clearly explain specific movements and expected outcomes for muscle groups, etc. Most important for me, though, is that getting up at 5:30 am for group training is motivating and really fun. I always walk away feeling that I am supported and encouraged to achieve my fitness goals. At other times, I have worked with Alan to prepare for triathlon. His training plans are easy to follow and specific to my needs, as he reviews my personal goals for each race prior to developing my training plan. I have also worked with him on nutrition and find him knowledgeable about fueling appropriate during my months of training, but also on race day. Overall, I find Alan to be extremely knowledgeable about fitness and nutrition and value the time he puts in to planning for a productive training session, or customizing a training plan that works for me. Can't say enough about TriFit Evolution's philosophy and working with Alan! Alan hosts an incredible boot camp on Thursdays. In addition, I have trained with him for 3 years noticing great results. He takes a comprehensive approach by building you up with the basics and pushes you to reach your personal best. Finally, his versatility is what has kept me coming back. He provides advice on nutrition, personal training and tri/marathon planning. While he will push you, his manner is very encouraging and supportive. Alan is a top notch trainer... one who takes time to get to know you personally (your strengths and weakness), and personalize training plans just for you. Out of all the trainers I've worked with, he is by far the best. I highly recommend him to anyone that not only is looking to train for races, but is looking to loose weight and be healthy.